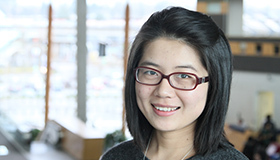 Xiaolan’s professional background is Computer Applied Technology and she received a Masters Degree from Shandong University in China. Xiaolan came to Vancouver in 2012. She is currently a second year PhD student in interaction design in the School of Interactive Arts and Technology, Simon Fraser University. She is interested in local food practices and has been doing studies on the practices of community gardeners and the connections community gardens build with other organizations. In her spare time, she loves playing with her cat Huleng and going out with her uncle’s family.